Includes an Olivia mini-doll figure, plus Zobo the robot and Rumble the hamster figures. Features a vintage airplane with turning propeller, small airport building with air traffic control tower, refueling station and a snack table with stools. Accessory elements include a walkie-talkie, helmet with goggles, traffic cones, marshaling paddles, a range of tools, drink and a sandwich. 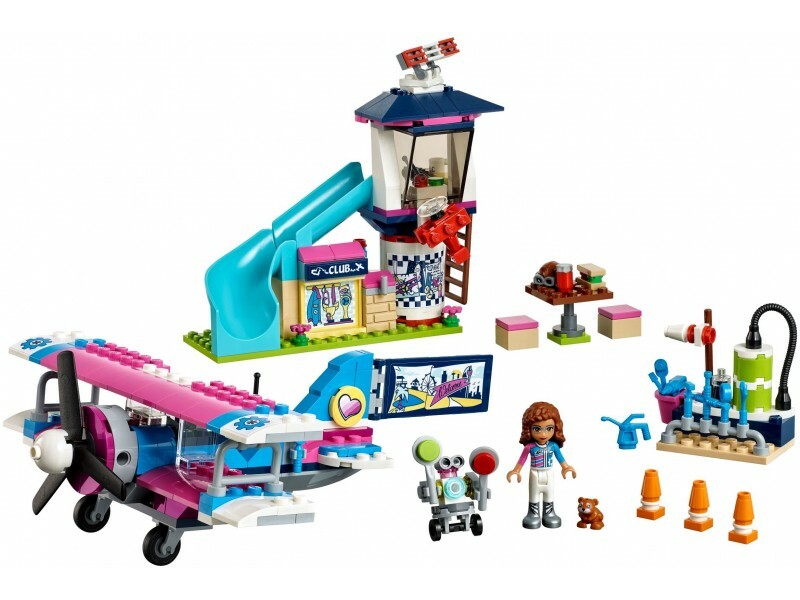 Fly over Heartlake City with Olivia to complete special missions and ensure all is well on the ground with this LEGO® Friends airplane set. Help Zobo and Rumble prepare the plane and take their seats behind pilot Olivia for takeoff. Check for clear skies in the air traffic control tower or slide down to enjoy a pre-flight snack at the table. Airplane measures over 2” (6cm) high, 8” (21cm) long and 6” (16cm) wide. Airport building measures over 5” (13cm) high, 5” (13cm) wide and 2” (6cm) deep. Refueling station measures over 1” (4cm) high, 1” (5cm) wide and 1” (3cm) deep.